We are proud to announce that on June 28, Duncan Aviation’s Lincoln, Nebraska, FBO facility gained the International Standard for Business Aircraft Handling (IS-BAH) Stage I accreditation. IS-BAH, developed by the International Business Aviation Council (IBAC) and the National Air Transportation Association (NATA), is a set of global industry best practices for business aviation ground handlers that features at its core a safety management system (SMS). We are the first and only large MRO to achieve this accreditation. I am proud of my team and the company for all the hard work they performed to make it happen. We say it time and time again. Two of the most important criteria for customers in business aviation are quality and safety. At Duncan Aviation, we have a great industry reputation in both. This comes through high standards in the way our products and services are delivered. Those standards become part of our culture, our tribal knowledge. Yet it is difficult to explain this culture to potential customers who haven’t visited our facilities before. That is what IS-BAH provides. The rigorous standards established through the IS-BAH program set a high bar for the industry. Although Duncan Aviation was already meeting the majority of those standards, applying for the accreditation forced us to take all of our tribal knowledge and turn it into official, written policies that can be tracked and measured. I asked FBO Team Leader/FBO Safety Officer Bob Cornett and Line Service Rep Sean Jensen to lead the effort. They leaned on the Lincoln Airport Authority and team members throughout the facility, including experts in the areas of quality, flight, safety, environmental, security, and many others. They wrote and added 54 policies. These policies are now part of our enterprise knowledge for all locations. And as a bonus, customers who look for the IS-BAH rating will also know what to expect when they utilize our services. According to IS-BAH, there are currently 57 IS-BAH Stage I accredited FBOs in the United States and globally there are 138. 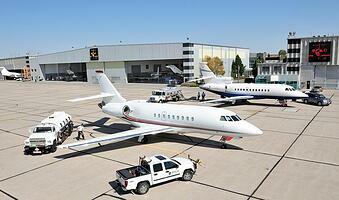 As a large MRO provider, attaining IS-BAH certification is a little different for us. It required some unusual policies and scenarios that most FBOs don’t need or see. For example, we often tow aircraft in atypical configurations, like with the tail removed or no interior in place. With IS-BAH, best practice policies for all of the variants are now documented, tracked and consistently applied. The IS-BAH process typically takes a couple of years to complete. With our high standards, focus and cross-department collaboration, though, we were able to complete the Stage One accreditation in just five months. This is a huge accomplishment! Thanks to everyone to played a part in developing this competitive advantage for our Line Services. We will begin the process for accreditation at our FBO locations in Battle Creek and Kalamazoo, Michigan, and expect to have that done by the end of the year. In addition, our Provo, Utah, Line team will use the same processes and procedures. We expect they will receive accreditation within their first year of operation.